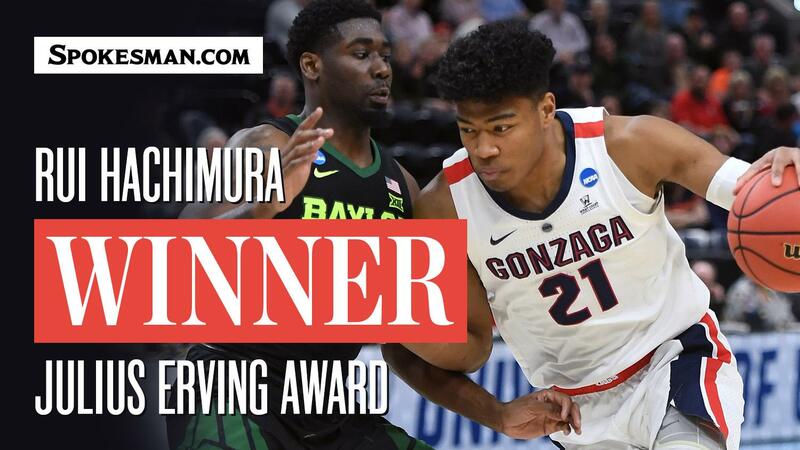 Rui Hachimura added another major honor to his collection of awards. Gonzaga’s standout junior forward was named the Julius Erving Award winner as the top small forward during ESPN’s College Basketball Awards Show on Friday in Los Angeles. Erving presented Hachimura with the award while head coach Mark Few, assistant coach Tommy Lloyd, who recruited the Japanese native to Gonzaga, and director of analytics Riccardo Fois looked on in the audience. Hachimura became the second Zag to win one of the five individual position awards. Przemek Karnowski won the Kareem Abdul-Jabbar Award as the top center in 2017. Hachimura was picked over finalists Marial Shayok (Iowa State), Caleb Martin (Nevada), Admiral Schofield (Tennessee) and De’Andre Hunter (Virginia). Hachimura, who barely spoke English when he arrived in Spokane in 2016, averaged 2.6 points while playing 130 minutes as a reserve on the 2016-17 squad. He averaged 11.6 points as the first big off the bench in 2017-18. He started all 37 games this past season, leading GU in scoring (19.7 points) and finishing second in rebounding (6.5). He played 30.2 minutes per game, third most on the team. The 6-foot-8, 230-pound Hachimura previously won West Coast Conference and District IX player of the year honors. He’s been named first-team All-American by the National Association of Basketball Coaches (NABC) and U.S. Basketball Writers Association (USBWA). He joined teammate Brandon Clarke on the 10-player Wooden All-American team. He shot 59 percent from the field and reached double figures in 35 of 37 games, with 21 games of 20 or more points. He posted four double-doubles for the Zags, who lost to 75-69 to eventual national runner-up Texas Tech in the Elite Eight. Hachimura joined Arizona’s Stanley Johnson (2015), Michigan State’s Denzel Valentine (2016) and Villanova’s Josh Hart (2017) and Mikal Bridges (2018) as Erving Award winners. Johnson, Valentine, Hart and Bridges are playing in the NBA. Hachimura hasn’t announced his intentions, but he’s considered a first-round NBA draft pick, and most anticipate he’ll skip his senior season at Gonzaga. Gonzaga senior Josh Perkins was one of five finalists for the Bob Cousy Award (top point guard) that was presented to Murray State’s Ja Morant. Published: April 12, 2019, 6:14 p.m. Updated: April 12, 2019, 9:23 p.m.